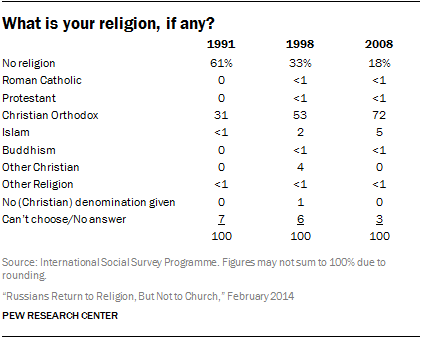 But for most Russians, the return to religion did not correspond with a return to church. 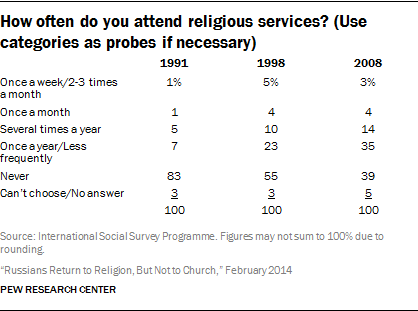 Across all three waves of ISSP data, no more than about one-in-ten Russians said they attend religious services at least once a month. The share of regular attenders (monthly or more often) was 2% in 1991, 9% in 1998 and 7% in 2008. This suggests that although many more Russians now freely identify with the Orthodox Church or other religious groups, they may not be much more religiously observant than they were in the recent past, at least in terms of attendance at religious services. For centuries, Orthodox Christianity was the dominant religion in Russia. This began to change in the early 20th century, following the 1917 Bolshevik Revolution and the imposition of state-sponsored atheism as part of communist ideology. During the Soviet period, many priests were imprisoned, many churches were converted to other uses or fell into disrepair, and people who publicly professed religious beliefs were denied prestigious jobs and admission to universities. While it is likely that some share of the population continued, in private, to identify with the Orthodox Church and other religious groups, it is impossible to measure the extent to which these attachments survived underground during the Soviet period and to what extent they faded away. 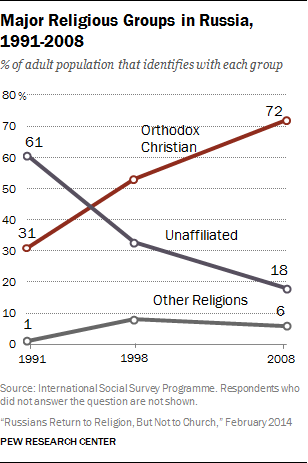 Similarly, it is difficult to disentangle the extent to which the upsurge in Orthodox affiliation found in the surveys represents an expression of long-held faith or a genuinely new wave of religious affiliation. 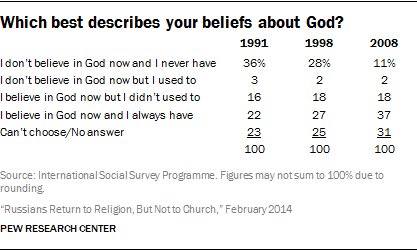 It may be that after the fall of the U.S.S.R. in 1991, Russians felt freer to express the religious identities they had quietly maintained during the Soviet era.3 However, given that the share of Russians identifying with a religion rose almost as much between 1998 and 2008 as it did from 1991 to 1998, the data suggest that the change is not solely an immediate aftereffect of the collapse of the Soviet system. 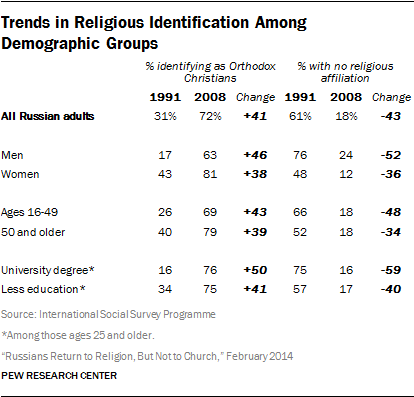 Similarly, the ISSP surveys show increases in identification with Orthodox Christianity among both younger Russians (up 43 percentage points among Russians ages 16-49) and older Russians (up 39 points among Russians ages 50 and older). 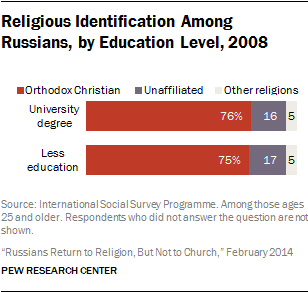 And affiliation with Orthodox Christianity has grown substantially among Russians at all education levels, especially among Russian university graduates. The remainder of this analysis examines religious affiliation and religious beliefs and practices by demographic group in 2008, the most recent year for which ISSP data are available. In 2008, Russian women were more religious than Russian men, and Russians ages 70 and older were more religious than younger age groups on some measures. 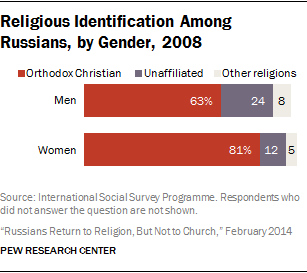 Russian women were considerably more likely than men to identify as Orthodox Christians in 2008. While about eight-in-ten Russian women (81%) were Orthodox Christians, fewer Russian men (63%) said they belonged to the Russian Orthodox Church. 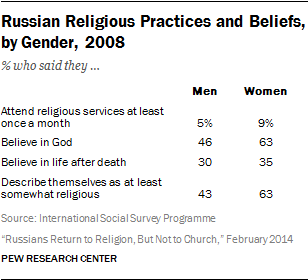 At the same time, about twice as many Russian men (24%) as women (12%) said they had no religious affiliation. By several measures, Russian women also had higher levels of religious commitment than Russian men. For example, much larger shares of women said they believe in God (63% of women vs. 46% of men) and described themselves as at least somewhat religious (63% of women vs. 43% of men). However, Russian women were not much more likely than Russian men to say they regularly attend religious services (9% vs. 5%). 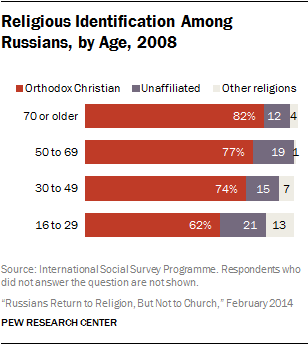 Majorities of all age groups in Russia identified as Orthodox Christians in 2008. However, older Russians were more likely than those in younger age groups to say they belong to the Russian Orthodox Church. More than eight-in-ten (82%) Russians ages 70 and older identified as Orthodox Christians, compared with 62% of Russians ages 16-29. Meanwhile, identifying with religions other than Orthodox Christianity was more common among younger Russians (13% among those ages 16-29, 7% among those ages 30-49) than among older Russians (1% among those ages 50-69, 4% among those ages 70 and older). According to the ISSP data, Muslims account for 9% of Russians ages 16-29, 6% of Russians ages 30-49, 1% of those ages 50-69 and 3% of those ages 70 and older. 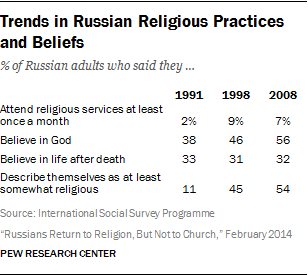 With a few exceptions, religious practices and beliefs did not differ widely by age group in Russia in 2008. 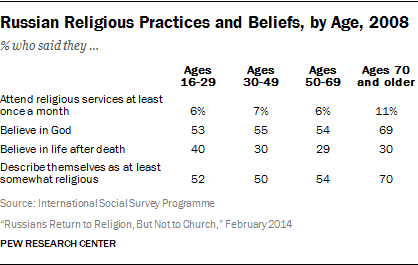 However, Russians ages 70 and older were more likely than younger cohorts to say they believe in God and to describe themselves as at least somewhat religious. 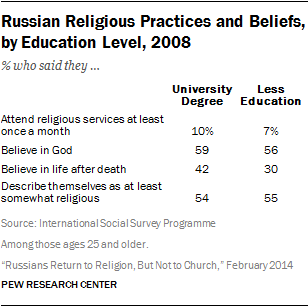 In 2008, Russians’ religious affiliation did not differ markedly by education level. About three-quarters of those with a university degree and of those with fewer years of formal education identified as Orthodox Christians, while about one-in-six in each group said they had no religious affiliation. Religious commitment also did not vary much by education level, according to several measures, including frequency of attendance at religious services, belief in God and describing oneself as at least somewhat religious. 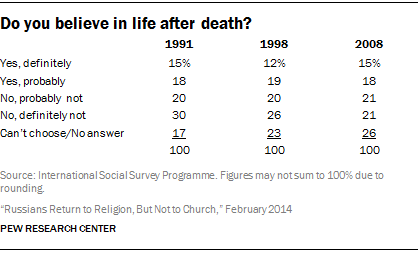 The only measure on which education level made a significant difference was belief in life after death; Russians who have a university degree were slightly more likely than those with less education to say they believe in life after death. The data used in this report are from the International Social Survey Programme (ISSP), a consortium of researchers who conduct public surveys in about 50 countries according to international sampling standards with comparable questionnaires across countries. The ISSP includes many North American and European countries as well as a few nations in South America, Africa and Asia. The trends in this report go back to 1991, the year the USSR was formally dissolved and the ISSP conducted its first survey of religious beliefs and practices in Russia. 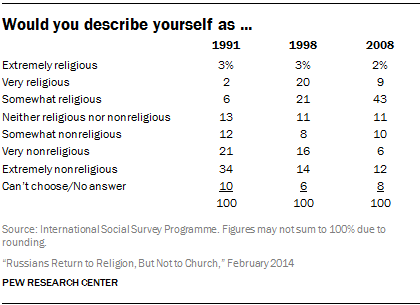 Religion also was the focus of ISSP surveys in 1998 and 2008. 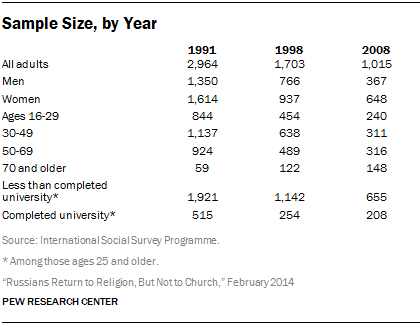 This report is based on data from the ISSP Religion cumulative file. The surveys are probability samples that are geographically stratified and are nationally representative of the Russian adult population ages 16 years and older. Data were collected by self-administered questionnaire May 15-June 6, 1991; Sept. 5-26, 1998; and Jan. 2-26, 2008.6 Surveys were conducted in the Russian language. All survey estimates use weights provided by ISSP staff. Sample sizes for the total adult sample and subsamples are shown in the table above. Based on sample sizes and designs of the surveys, the margin of sampling error for results based on the total sample is roughly ±3.0% in 1991, ±3.3% in 1998 and ±4.4% in 2008, with larger margins of error for subgroups.